I recently (2010) saw Mark Flagler’s PBS documentary on through hiking the Appalachian Trail entitled Appalachian Impressions. I followed that up by reading Bill Bryson’s A Walk in the Woods, as well as Walking the Appalachian Trail by Larry Luxenberg. All of them reminded me very much of the paltry dozen or so miles I put on the AT one summer with my brother and my father. I have to point out we were by no means newbs in the woods, although experienced readers may blanch at some of my tale. My father had grown up on Ernest Thompson Seton’s Two Little Savages (Seton was the founder of the American Boy Scouts) and was essentially a woodsman before he was a man. As a young adult he was active in Boy Scouts and gave thought to being a Professional Scouter. He had led dozens of boys in the Adirondacks on canoe trips and he and I had done our own three day canoe trip in the vicinity of Mt. St. Regis and Paul Smith’s College in the late ’50s. For years our family’s modus operandi for summer travel was by camping (admittedly not backpacking) and we were by no means unfamiliar with outdoors and wilderness activities. Add to all that, my brother and I each had our own Scouting history. My mother dropped us off at an access point near Crawford Notch off US-302. She then retired to our tent set up at the Franconia Notch campground to spend the night alone while we were out. Those who knew Mom cannot comprehend she would ever have been able to do that, but camping was different in the early ’60s. We hiked what I remember as something like an unpaved access road, probably a couple or three miles. 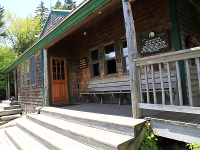 We came to an AMC (Appalachian Mountain Club) hut (Zealand Falls, 2,630') and had a hearty lunch there (I think I remember clam chowder which was very good). Our good experience at the hut hung in the backs of our minds for the rest of the trip. After lunch we started up the AT toward Zealand Mountain. We had refilled water bottles at the hut, partly just ’cause, partly because we knew we probably wouldn’t be near water until after summiting. It was a steady, although relatively easy uphill, as I recall—started out in woods, which thinned out the farther we went. Eventually, dusk came but with it, a full moon (or nearly so)—plenty of light for continued hiking. The signature recollection of this adventure: at one point (and now quite dark) we came to something of an overlook (looking generally east). A great valley with hills farther away spread out before us—the hills, hidden in the dark, more of a memory from the afternoon light. I stepped a little closer to the edge and was literally smacked in the eyes by a bright light from down below. My first reaction was that there must be some sort of event down below with search lights to draw attention. Then I thought, “we’re in the middle of a wilderness—what attraction would there be out here with searchlights?” I thought about it for a bit, took another look and realized the “light” was the reflection of the moon off a pond several hundred feet below. In the years since, I’ve often pondered the precise combination of heavenly geometry necessary to produce the congruence of sun-to-moon, moon-to-earth, pond-to-precipice, and me standing there to receive the effect. Amazing, once in a lifetime. We continued hiking for a while in the moonlight (see previous paragraph). I have no notion of what time it now must be, but we decided bedding down while there were reasonable sites might be a good idea. We selected an area alongside the trail that seemed to be covered with a soft green ground cover of some sort (none of us were botanists, by any stretch), and spread out our sleeping bags and pads. We had not felt a tent a necessity for this hike, nor did one prove necessary. My later day recollection suggests we must have finished our water by this time, or even sometime before (I have been quoting 17 hours for years—the math requires it must have been before dusk). We weren’t concerned at that point, as we assumed we’d encounter a supply sometime on the descent the next day. We had an uneventful and restful night, arose, struck camp, and commenced the second day’s hike. I don’t remember breakfast details. I do remember becoming aware of a paucity of blazes as we continued up, although I couldn’t imagine an opportunity to have gotten off the trail, even during the moonlight hiking. At some point we got above treeline, which was exhilerating itself, as the path seemed starkly clear—bare stone below, scrub brush no higher than our knees or hips as far as the eye could see left and right. Sometime around mid morning we reached the summit (4,260'), still with no blazes, plaques, cairns, or other notice of our achievement. I now know that we didn’t actually go to the summit of Zealand—it’s several hundred feet off the trail and provides no views. We actually hiked on until reaching Mt. Guyot, although we didn’t know that at the time. We spent a while at the top, attempting to orient ourselves to confirm our location. It was here that we were struck by the dismally large scale of the AMC maps. We had a pretty good idea we were where we were supposed to be, and at least two of us were more than passably accomplished at orienteering (and with decent compasses), but maps are everything and these were almost nothing. Modern research (2015) leads me to believe that we had already crested Zealand Mountain, and were, in fact on the summit of Mt. Guyot (4,580') as we did our orienteering. It looks so obvious and simple now, but in 1964, while we weren’t exactly in fear for our lives, we were in serious doubt of our actual position and how to proceed. We headed down what seemed to be the path, by now aware that we really should focus on refilling our canteens. We weren’t at the “pebbles in the mouth” stage yet, but the prospect had been hanging around the edges. I remember us coming to a saddle, having a relatively level (and dry) half mile or so, and then starting another climb. I suffered on this one, outstripped even by my overweight and underconditioned brother. We summited (South Twin Mountain, I believe—4,902') and began our descent, again, on the most likely path, as we hadn’t seen blazes yet this day. We were starting to get anxious about the water situation, but as we dipped below treeline, calmed somewhat, and began looking for any signs of drainage in earnest (not much to look for on solid rock above treeline). While our orienteering on the bald had been less than encouraging, our conclusion was that there really wasn’t any other reasonable direction to follow, so we went on. We continued down, and after some time, finally cut a brook in, now, the thick of the woods. My recollection is that it must have been noon or a little after by now, and I don’t remember if I ciphered the 17 hours at this point or if I recreated it later. It doesn’t matter. We felt increasingly anxious at several points the previous night and approached desparate during the whole of the morning, but all of that angst disappeared in the first swallow or two of a limitless supply now at hand. I should point out that in those days, it was still safe to drink out of running mountain streams. Most now recommend against that, without treatment. Another concern reared its head (and we were still unconvinced of our orientation to the trail) by now. My father had always had problems with his knees owing to a misspent youth of football and skiing injuries. He’d already had cartlidge removal done in one of them in the late ’50s, and he ultimately had replacements done in both in the ’70s. While the climbs had not been a problem for him, the descents were starting to bother him. No decision on anything was possible at this point, but we started to redefine the mission goals. We climbed out of the stream bed (on still, the presumed trail) and shortly, came across another AMC hut (Galehead, 3,800'). That settled things insofar as position—we were absolutely where we were supposed to be. We had a great lunch, filled up on water, and examined our options. My father would have crawled to finish the hike as originally planned (all the way to Franconia Notch), had my brother and I been so callous to express such a desire, but we all agreed that getting off the trail and back to civilization was the best idea. The AMC staff advised us of their supply trail, a shortcut off the AT to US-3. It wasn’t as well marked as the AT (hah!, so far as we were concerned), and it was steep, but it was the quickest way out. So, properly refreshed and informed, we started down the supply trail. Somewhere along the way, we passed two volunteers coming up the trail with packs full of supplies and they reassured us, both verbally and by their presence, that we were on the right path. I have always suffered in the shoulders from my pack, and I’m sure we had made every attempt to keep ours in the neighborhood of 25 pounds or less, so I was utterly blown away by the 60 or more pound loads those guys were carrying…uphill. I recall the trip down as comprising the better part of two hours, although after more than fifty years, the clock for the entire adventure is a little rubbery in my mind. Not only the clock, but as it turns out, I have at least two scenarios in my mind for the denouement—each equally plausible, neither provable nor more likely in my mind. At the bottom of the trail we came out to US-3 and knew we were at least a few miles from the campground where my mother was holding down the fort (another implausible situation as described above, yet wholly true). My thinking now is that Dad probably was done walking and that he and my brother would wait at the trailhead while I slackpacked my way down to Franconia Notch park to get my mother and then drive back to pick up my father and brother. I definitely remember getting picked up by a driver in a red convertible and flying down the road to the campground. The second version is that we all got picked up in the convertible and got back to my mother together. I just don’t remember. Update: I checked with Mom and she confirms I came down alone and together we went back to pick up Jerry and Dad. Folks who have never been more than a handful of hours away from liquid refreshment may scoff at seventeen hours without water as some sort of deprivation. Experienced active people will not. I would also suggest there’s a world of difference between choosing not to drink and can’t find a drink. We were walking, carrying packs, climbing, in the sun, at altitude (>4,000'), for quite a while. Even modest hydration recommendations would suggest we should have consumed at least a couple of liters of water by the time we found that stream. While we weren’t at the swollen tongues stage yet, we were seriously in need of some water. It was not a comfortable experience. Periodically since writing the above, I’ve reflected on it with varying degrees of satisfaction. I hinted at some of my misgivings when discussing how long we were without water. As I’ve discovered maps I’ve started to think we must look like a bunch of wusses only managing about 14 miles of hiking. Well, I don’t feel quite so inadequate anymore. In my 2015 research, I’ve encountered several narratives of people hiking that same segment. Among the themes are scarce water, scarce markings, steep sections, beautiful overviews, and some ambiguity over the peaks encountered. I guess we weren’t so far out of the norm, after all. Moreover, the movie Wild has come out, and it focuses on backpacking in ways I don’t recall being depicted heretofore. The first point in the movie which absolutely resonated with my experience was the notion of Cheryl’s first pack. I paused the movie (bride loves that) to observe how ridiculously heavy it was (seventy pounds I’ve read in interviews). Secondly, distances caught my eye, too. In the abstract, the 7.7 miles from Zealand Falls hut to Galehead hut seems like a literal walk in the park. A non hiker would probably not be intimidated by that distance. However, I can assure you that with 25 or more pounds on one’s back and several thousand feet of elevation change, 7.7 miles is a day’s work for the average backpacker. It’s no accident that the AMC (and like organizations) space their huts about that interval. Just for the curious, I now calculate that it was 2.8 miles up to Zealand Falls from the drop off, 7.7 on the AT itself, and another 4.6 down the access trail to the parking lot near US-3. That’s 15.1 miles by my calculation. Although I wouldn’t have sworn it at the time, I now believe we were likely never actually off the trail, so those mileages should be reflective of our accomplishment. One of the things I suspect is that trail conditions weren’t the same in 1964 as they are in the 21st Century. I’ve seen other remarks regarding the paucity of blazes, and I remain convinced that what we didn’t see just wasn’t there. Through the fifty year haze I also do not recall any summit cairns, although as I continue to read others’ narratives, I’ve also come to realize that we didn’t actually summit Zealand Mountain—it’s about 500' off the trail. We also probably didn’t go over the Bonds summits, although they’re nearby and look much like Mt. Guyot at the top. Our stealth camp would certainly be illegal today, but I think it might not have been in ’64. Fifty years is a lot of difference in human impact given the growth of the outdoors industry. 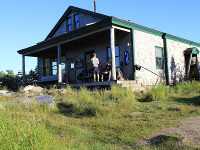 A lot of narratives report a fairly high density of hikers both on the trail and in the huts nowadays. In fact, it is claimed that more people visit the White Mountains than Yellowstone and Yosemite National Parks combined. Those are our two most popular parks. Yet, in the Summer of 1964, while we saw a few people at the two huts, we didn’t encounter a single hiker while on the trail. What I saw that night (the moonlight reflection) I now believe was likely Zeacliff Pond, although there was no mention of it in any of the literature of the time. I also suspect we did take the several hundred foot side trail to the overlook above it, but I have no specific recollection of it. I’ve included an image of a ≈1950 topo map of the area, which very much approximates what we had in terms of scale. I doubt I could navigate off of it today any better than we did in ’64. Maps available today are much better in terms of scale. Plus, if we had had internet narratives in advance—copious today, but not available then—a lot of our expectations and subsequent experience would have been much less stressful. That wouldn’t have helped my dad’s knees, though. But there wouldn’t have been much of a narrative to publish.